Great wallet. I like the style. Showcasing a sleek, versatile silhouette, this zip wristlet by MICHAEL Michael Kors features a signature print for instant sophistication. 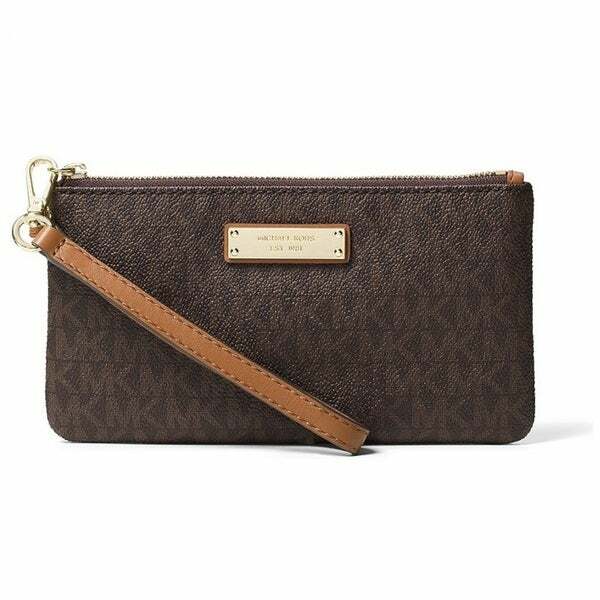 The Michael Kors Signature Jet Set Item Medium Brown Wristlet is the perfect size. I bought it for my daughter and she loves it. It is a great price and very fast shipping. I bought this for myself many months back. It is so gorgeous and the quality is outstanding. So I purchased another one for my mother in law. You can’t beat the price and it’s perfect if you don’t want to carry a big purse around. I am so happy with this wristlet. I will definitely buy more! I bought 3 of these wristlet one of each color. The are very nice. A little on the small side, nevertheless can still hold my phone and easy to carry along. the price was awesome at overstock. My package arrived Christmas Eve. I was delighted to have it as it was a gift. My daughter loves Micheal Kors handbags and I thought this would be a great gift for her. Price was right, and was received in excellent shape. Cant wait for her to open it. Looked Great my daughter loved it and it made a great gift for Christmas. I would recommend getting something like this in the future for all the guys who aren't sure about what purse to get. I love these wristlets. I use them for all of my extra cards that I carry. It's great to also put extra Kleenex or makeup in as well. I got this for my daughter in-law who is a teacher and she loves it! She’s constantly caring boxes of class papers and she loves this because she can put her phone keys and wallet and put on her wrist! Was given to my daughter from her grandmother for Christmas. It is the perfect size for going out with. Fits her iPhone and her other items she needs when going out. I like this just wish it was a little bigger. The quality and price were great! Very happy with this purchase! Great price and cute little bag. Exactly what I expected! Love it!! Bought for a gift love it . I know she will love it! "Does iphone 7 plus fit on this one?" Yes. As well as the 8. This wristlet is the perfect size. I also bought Coach and the Coach is to small to hold any phone unless it's a small flip phone, so useless. These wristlets are used more than the purse itself. Very smart purchase. Yes....It is a tight fit bit there are 3 pockets inside for credit cards and folded cash. I have a Galaxy 8 Plus that fits. Yes. The iPhone 7 and 8 fit fine. "Does this wristlet still have a ticket and does it come in a bag?" Yes is had a ticket on it. It came wrapped in plastic. I wrapped them separate from the Michael Kors purse and as connivence, the wristlet is used more than the purse because it's large enough to hold the iPhone and small enough to take anywhere.